I found this infographic on Pinterest, however when I researched where the data came from I found multiple branches of sources. The first “fact” I was concerned with in this image was the 48 million styrofoam cups used daily. I grew up in New York City where there is a coffee cart every half a block. I bought coffee every day at many various locations and I was only ever handed paper cups. Even when buying drinks from a deli or Dunkin Donuts I usually am given plastic, not styrofoam. After researching the amount of styrofoam cups used by Americans, the average was about 1 billion per year. When you use this number to find cups per day it comes out to approximately 3 million per day. 3 million per day is significantly less than the 48 million daily number on the infographic. Next, I found a website that specifically looks at coffee statistics. This website states that the average price of a cup of coffee is actually $1.38. Surprisingly, on the website Statistic Brain I found almost all of the data exactly the same as on the infographic. Noticeably, the data was sometimes reversed to show larger percentages on the graphic. For example, on Statistic Brain it states that 35% drink their coffee black. The opposite of this would be those who add cream or sugar (the 65% on the infographic). 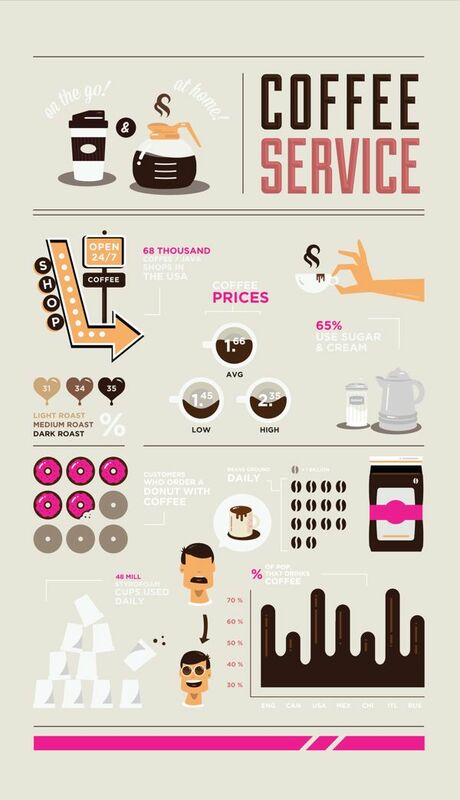 Larger percentages and statistics makes the infographic seem more interesting to read and seems to stand out more when it comes to the facts and figures of coffee drinking. Almost all of their remaining data points match precisely with what was posted on Statistic Brain. After following through 4 other sources from Statistic Brain to Live Science Magazine eventually to a study published in the Archives of Internal Medicine, did I find the original source of the data. the study was actually performed in 2011. I think that the data found in the infographic posted, while interesting, is misleading because of its outmoded facts. This really emphasizes how we should always question the information that we are given and check the relevance of the data. Google & Privacy. Worried? You shouldn’t be. Vaidhyanathan criticizes Google for having a “lack of privacy” and for being an invasive “smokescreen”. While Google does have a history of exposing private information, their mission, overall, is not to expose our private lives. Indeed, there are times where it seems Google is absorbing every bit of information like a sponge. What we must remember is that the purpose of this information vacuum is for our benefit. Google’s purpose is not to blackmail us. Vaidhyanathan is concerned about the amount of data Google holds but he might as well be just as concerned with the government. We send in tax forms and fill out censuses with just as much information regarding our lives. David Carr, writer for the New York Times, argues that although Google’s motives have been called into question, it is overall an extremely useful tool. In his article “How good (or Not Evil) is Google?” he points out that Google financed more than $4 billion dollars towards pure research and applications to make it more powerful in order to please us, the users. Both authors point out the 2007 incident where Google scanned millions of books without permission. Vaidhyanathan argues this as evidence that Google is invasive however Carr makes a good point: no one else put effort into scanning these books page by page. Google’s goal here wasn’t to rip off all of the authors, it was to share the information in the books with the world and to preserve text that could otherwise be lost. Marie Curie’s books, for example, are too radioactive to touch and can be used by very few select scientists with expensive suits. This is a specific reason why we would need a company like Google to put the information online for all to see and use. By extending access to billions of people, Google is expediting the advancement of society. Yes, Google’s massive absorption rate and capacity of data is frightening but it is not being used for evil. It is only benefiting us and making our lives easier for the moment so even though Vaidhyanathan is critical, we shouldn’t be too worried. The amount of information that Google contains on every person is an enormous compilation of information. The data can be dangerous if it is being used against us however, it is only as dangerous as the people behind the screens. Using the data for a greater purpose; to benefit humans is all up to us. If we put data into the right hands then the positive outcomes will outweigh the negative side effects. In the passage, Google demonstrated that by use of its information, we were able to design a formula for detecting the H1N1 virus, eventually helping to control and calm the pandemic. We have so much technology and information that could be potentially harmful, however, we have to realize the information itself is not the problem. We, the people who make conscious decisions are the ones who make the choice. In Google’s case they helped save what would have been thousands of cases of H1N1. Many of us are engineers here at Tech. We are the minds behind the technology and we can control the use of it. We are the ones who will use technology to benefit the human race. There are many people who fear that the change in technology has been for the worse. Even though many fear change, overall I believe it has had a positive effect. Data is a tool that is no different than a swiss army knife; we could use it to harm others or to help others, but the decision is up to us. We are now able to live longer, travel faster and communicate further with technological advances. Technology can be dangerous but with the right minds controlling it can lead to a better society ahead. The amount of information Google contains on every human being is a dangerous thing to have. However, it is only as dangerous as the people behind the screens. In actuality, the information is arguably the most useful resource to mankind. In the passage, Google demonstrated that by use of its information, we were able to design a formula for detecting the H1N1 virus, eventually helping to control and calm the pandemic. We have so much technology and information that could be potentially harmful, however, we have to realize the information itself is not the problem. We, the people who make conscious decisions are the ones who make the choice. In Google’s case they helped save what would have been thousands of cases of H1N1. Many of us are engineers here at Tech. We are the minds behind the technology and we can control the use of it. We are the ones who will use technology to benefit the human race. There are many people who fear that the change in technology has been for the worse. Even though many fear change, overall I believe it has had a positive effect. We are now able to live longer, travel faster and communicate farther with technological advances. Technology is a tool that can be dangerous but with the right minds controlling it can lead to a better society ahead.